Oy! You get out of there NOW!!! 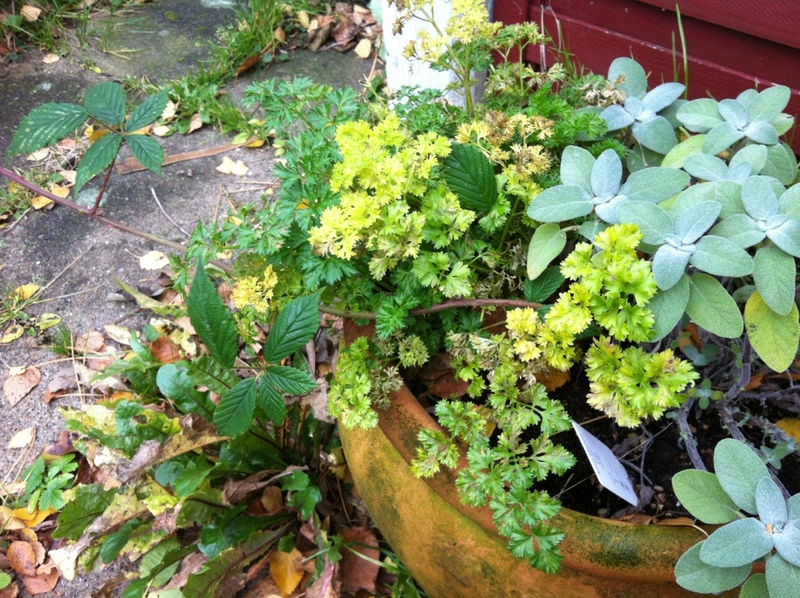 There is a lovely weathered terracotta pot in the courtyard that is home to some parsley and sage, as well as whatever weeds have decided to set up camp there. This is all good. However, when the brambles or blackberries or whatever they are decide to mingle with the herbs I resolutely untangle them and pull them back up on the fence where they should be! 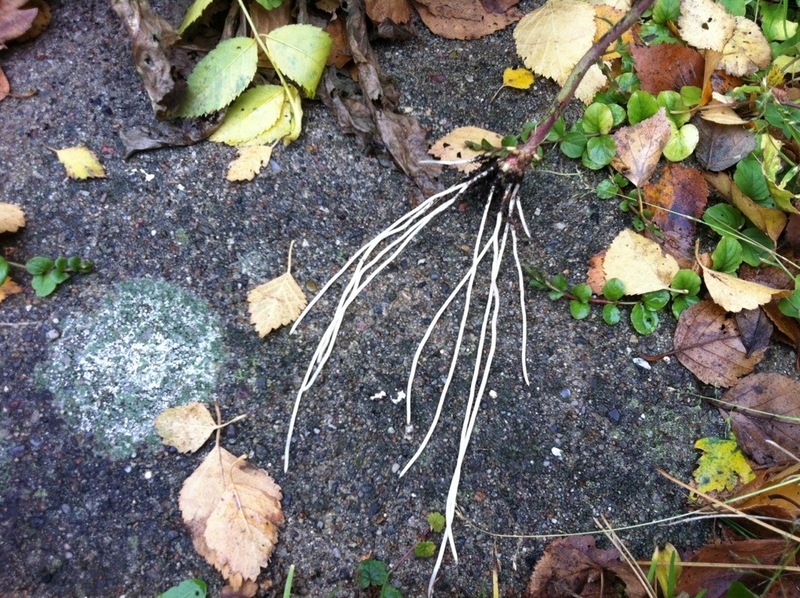 Except this time the bramble vine had not only entangled itself with the herbs; it had decided to root! Clearly this sort of unacceptable behaviour cannot be tolerated, so I swiftly yanked up the culprit and went to get my secateurs to put an end to this. I ended up with a rather nice cutting, and clearly anything that will root this easily is most likely a vigorous grower, so off it went to the hedgerow where it can tangle itself up with the barberries and honeysuckles to it’s heart’s content. For the record, it does produce some rather tasty berries, so it’s violent disregard for what should grow where is overlooked for now. BUT DON’T DO IT AGAIN!!! I didn’t mean to. I swear! I was visiting my parents from Saturday to Monday this Whitsun weekend, and on Sunday a guy from down the road stopped by for a cold beer in the sun and to offer my Mum to get some shrubs from an area of his garden that he needs to clear. – So I borrowed a spade and a garden fork and began digging up saplings! I got 5-6 good saplings (1-2ft high) which where then stored in a bucked of water before I put them in a plastic carrier bag this afternoon and brought them as hand luggage on the coach across the country. I think they will end up in The Hedgerow, but I might change my mind. I think I will keep them in a holding pattern until I can get the Flâneur Husband’s input on the matter when he moved back to Denmark – permanently – on Friday. My Mum also promised she’d get my brother to dig up a medium-sized spirea for me and plant it temporarily until she comes to visit by car later this summer, as and when my Dad’s illness will allow it. She’s now on care leave from her job so she can be there for him to the end, and to be quite frank there isn’t much reason to hope – or fear? – that it will last too much longer. We all know what’s coming, and that it will come sooner, rather than later. When it does happen, I think it will be good to drag my Mum away from the house for a long weekend shortly after the funeral, just to mark that it’s not the end of anything, really; it’s just a fact of Life, and Life goes on. Anyway, the aquatic plants were delivered to my office on Friday, so I stopped by on Saturday and picked them up on my way home from the garden and before going to my parents’. The water lily and the frogbits are currently licing in a bucket in the bathroom and doing much better – I’m so glad I didn’t wait until tomorrow to bring them home, since the water lily in particular was in a bit of a state after the trip with the postal service. 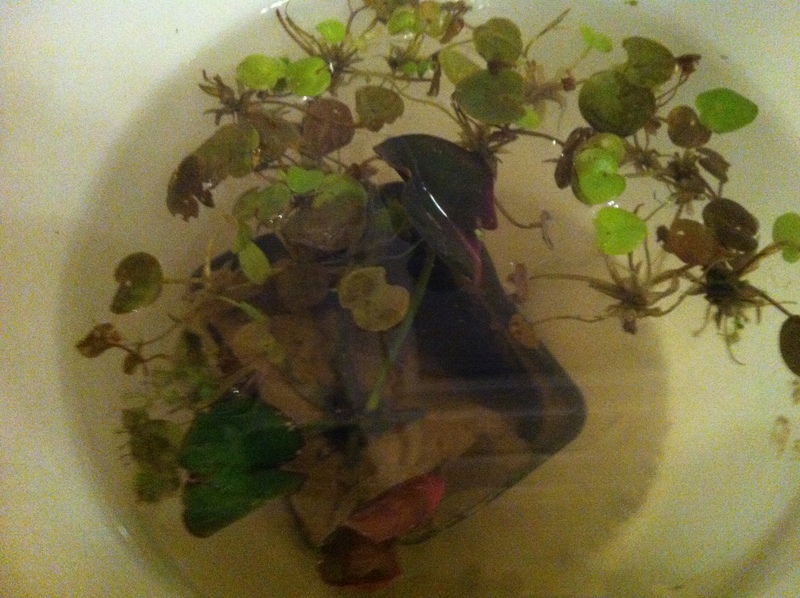 The frogbit had fared better, as it is a floating plant and just got a bit entangled with itself, but the water lily is planted in aquatic clay, and the clay had sort of squashed the plant and needed some rearranging before I could see the actual plant properly. Left in the bucket for a few days, though, it seems to have gotten back on its feet quite nicely, and it’s now looking quite cheerful, three leaves floating on the surface amongst the smaller frogbit leaves. I think the plants are happy to be in my care. At least, I hope so. And I hope they will enjoy their new home once they see it. A newsletter coaxed me – rather too willingly, I fear – to visit a seed-pusher’s website, and before I knew it I had place an order where only one item was actually on my list of things to grow this season. The above is a randomized mosaic of the seeds I ended up with, ranging in difficulty from “suitable for children” (PERFECT!) to “Experience useful” (i.e. sow at 24C, then keep moist for five weeks, place in plastic bag in the fridge for 2 weeks, do ritual shamanistic dance to encourage germination, transfer seedlings to individual pots, have nervous break-down and end up throwing them from the roof of the apartment building at innocent passers-by). Except for the vegetables (which will – not surprisingly – go into the vegetable beds) and the climbers (ipomoea and Asarina antirrhiniflora which will go into the hedgerow to add some summer blooms and some bulk) I haven’t the faintest idea where the rest will go, but I suspect I might have to do another major “carve-new-flower-bed-out-of-the-lawn” project, probably as part of The Ambitious Border. I know for sure that there will be very little – if any – space for them in the Sunny Border if I want to reserve some space for dahlias. But here’s to wishing, hoping, dreaming and – perhaps – realising some of these wishes, hopes and dreams. A while ago, A Woman Keen On Sensible Footwear (a.k.a. Wellywoman) commented on one of my recent posts that she wasn’t aware that forsythias would root in water. Granted, it does take some time, which is why this lovely vase is grimed over with lime scale, but it’s a perfectly easy way to propagate this bush, either to create more of it or to create new undergrowth if it is beginning to get too top-heavy and tumble over. I generally find that most branches will root in water, given enough time, and the trick with the forsythia is just to let it bloom away, drop its flowers and then wait for the leaves to appear. Once you have leaves on your branches, the roots will be there in very little time, with no need for rooting hormones, special treatment or anything. In the vase above – as in all my vases of forsythia – I have mixed the forsythia branches with red dogwood. The red stems create a nice counterpoint to the brash yellow flowers, and once the flowers are gone the dogwood – in this case a rather pleasantly variegated cultivar (ooh, look at me throwing proper gardening words about; “variegated”, “cultivar”!!!) – will start showing leaves sooner than the forsythia. And of course the dogwood have as lovely flowers, even if less attention-seeking, as the forsythia. 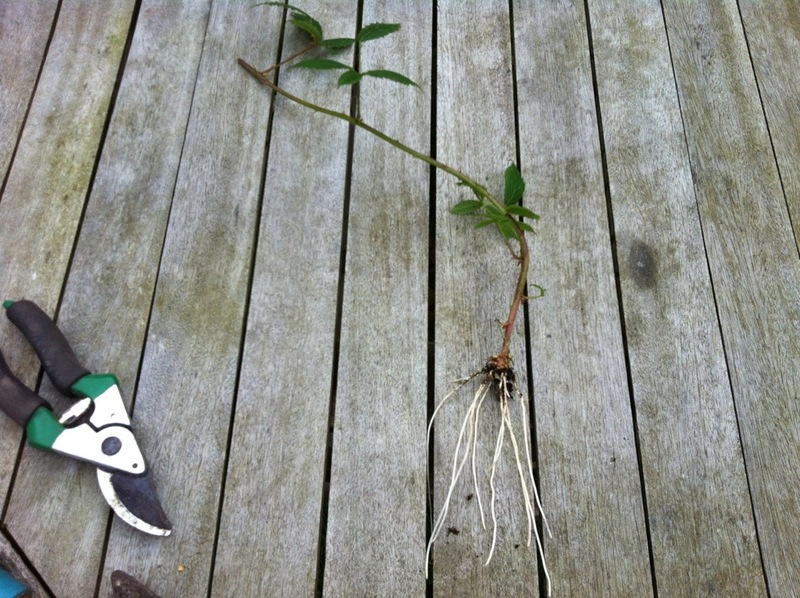 And the dogwood, too, roots before long. Considering that I’m trying to replace an ugly wooden fence with a hedgerow of living plants, I think this sort of propagation is about as easy a solution as you can get! I could, of course, also just start pinning down overhanging branches, leaving them for a year and then cutting them loose and transplant them, but this is so much quicker and also adds to my connection to the garden. I have it right here with me in the apartment! The pot at the back of the picture above is the sedum flowers I brought in as a bouquet last autumn and decided to keep, since they started rooting. So far it seems that my success with cuttings is a one-all; I have had no success with rose cuttings, in spite of taking numerous the year before last, but I’ve had great success with flowers that were just picked to be pretty in the apartment and then decided they wanted to live! Today I received a call that my husband’s compost – his birthday present from his mother – was delivered this morning, and of course this means I have a full weekend planned. I have only gotten as far as outlining the Sunny Border – a project I’ve imagined ever since we took over custodianship of this garden – so I need to dig away the turf and fluff up the soil beneath, mixing in a good measure of compost. The other day I bought something I don’t particularly like; a long piece of 8″ deep corrugated plastic to serve as a boundary between the Sunny Border and the lawn, simply so the grass won’t invade the new border the same way it has invaded the Ambitious Border. I might invest in more of this once I’ve weeded out all the grass in the Ambitious Border. It’s not pretty, for sure, but since it will be fully buried in the ground I guess I can live with it. I would have preferred a more natural material, but buying the wood to make something similar would a) be too expensive and b) probably be worse for the environment in general, since that wood would have to be cut, transported etc. to get to the garden. In other news the dogwood and forsythia branches that I forced in the apartment now have green leaves. The forsythia might have lost its yellow splendour, but the dogwood is getting ready to show off a few bunches of tiny white flowers. And both the dogwood and the forsythia are beginning to show signs of roots!!! NEW PLANTS!!! If they survive long enough they will end up in the Hedgerow toward the road, screening our haven a bit more from the outside world. More blossoms in spring, more variegated leaves in summer, more red dogwood stems in winter. I picked some sedum stems last autumn as part of a bouquet of flowers for the apartment, and as the rest of the flowers faded the sedums started creating roots in the vase. I threw the rest of the flowers away, cut down the sedums to a few inches, and all through the winter they’ve stayed alive in a glass of water on the kitchen table. Yesterday morning I decided that spring had arrived and that perhaps in a month there might be room in the garden for the remainder of a bunch of flowers, picked for their beauty and retained so that beauty might regenerate. So I potted up the small stems with their fragile roots and tiny leaves. It was propagation by accident, but I kept them alive. I watered them, nursed them and loved them – willed them – alive. It’s the greatest feat of magic imaginable, isn’t it?